Herman’s dad wore a hat every day. It’s one of his fondest memories of his father. In the old days, everyone wore hats. Hats meant something. Something more. They were a symbol of optimism and quality. They displayed care for craftsmanship and tradition. Herman Mihalich decided to throw his proverbial hat into the ring, start his own company and honor the principles above in his own special way. He founded Dad’s Hat Pennsylvania Rye Whiskey in the nearby town of Bristol where they handcraft their signature style of American Rye Whiskey. Rye is all they do, but it is available in two different proofs of aged Whiskey, two wood-finished spirits, an un-aged White Rye, and in special editions. Their Spirits don’t carry an age statement, and they are generally quite young. But one of the secrets to making good Whiskey from a young Whiskey is to use smaller casks. The standard for big production houses is 53-gallon barrels. Dad’s Hat uses charred 15-gallon casks that are absolutely tiny in comparison. This means more wood contact by volume, which “ages” the spirit faster. In this case, age is just a number. What matters is the taste. Dad's Hat Rye Whiskey Port Finish is produced of the same mash bill as their classic rye, comprised of 80% rye, 15 % malted barley and 5 % malted rye. After a year’s worth aging in charred American oak, the rye is finished in casks that previously matured port wine. The finishing episode adds a certain fruity temper and a red gold color to the spicy rye. Since everything is done by hand and all the ingredients are sourced locally, only 1200 bottles were ever produced. The end result is there for everyone to experience and savor. You see, contrary to hats, principles of excellence never go out of style. Come to think of it; even hats are back. 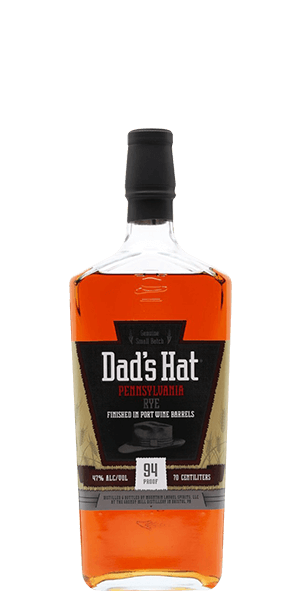 What does Dad's Hat Pennsylvania Rye Whiskey - Port Barrel Finish taste like? The Flavour Spiral™ shows the most common flavours that you'll taste in Dad's Hat Pennsylvania Rye Whiskey - Port Barrel Finish and gives you a chance to have a taste of it before actually tasting it. Well, it's a rye. I was hoping that this was more like the Basil Hayden's port finished rye, but it's not even close. Incredible aroma - vanilla, plums, oak, sweet flowers. After taking in the wonderful nose of this whiskey, I had high hopes for the taste, and was pleased, but also a little bit disappointed. The taste is certainly nice - with notes of dark fruit and the expected rye spiciness - but it didn’t “knock me over” the way that I’d anticipated when I first opened the bottle and caught a whiff of the aroma. Added a few drops of water and DID NOT like the result...the finish completely fractured and it took on a funky, “wet cardboard” aftertaste. Much better straight or in a cocktail. This may not become my “daily drinker,” but will definitely earn a place in my “I want something different” rotation. Makes a TERRIFIC Manhattan! All things considered, glad I bought - and will likely purchase again. Can I get it in a 1.75 liter???? Yes, I like it! The port aging really sets this apart. Neat, no ice, very nice. Nice rye spiciness, and very smooth finish from the port. Sweet and peppery. Very nice for the price. I have enjoyed this bottle as my first significant rye experience. I'm a fan of port, so I thought a port-barrel aged rye was a great and unique place to start. I'll admit that my ability to detect subtle flavors and aromas is still under development, but the flavor spiral for this one seems fairly spot on. It's easy to down a few glasses of this smooth-drinking rye. Tasty and quite spicy. Not terribly much better than much less expensive ryes, such as bulleit. Best Rye I have tasted. Very smooth with great flavor. Rye starting to replace Boubon for sipping. Start neat add a little water or several chips of crushed ice. Amazingly smooth rye. Simply a delight.